Are you a gardening enthusiast? Do you love to grow your vegetables and flowers ? 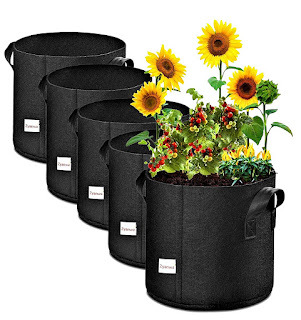 These 5 Gallon Breathable Fabric Root Aeration Pot With Handles are so nice! You can grow your vegetables and flowers in any sunny spot, on your deck, your front steps,in your yard, etc. They are environmentally friendly , made of BPA free polypropylene and have nylon handles to make these fabric pots easy to move around. Each pot holds up to 5 gallons and measure 12 " high and 9.5" wide. That's a good size for whatever kind of vegetable or flower you want to grow. These pots come in a set of 5, you can really grow a nice garden in these. The possibilities are endless as far as what you can grow and the landscaping and decorating you can do to your yard.They are very attractive fabric pots.